Henry Adams : Letters from Polynesia, 1891. Adams, Henry: Letters of Henry Adams, Volume 1. Houghton Mifflin Company, Boston and New York, 1930. Kraus Reprint Co., New York, 1969. Adams' comment on page 476, "neither dance nor game have I seen or heard of; nor surf-swimming," is often cited as evidence of the demise of surfriding inTahiti by the end of the 19th century. In The Surf Blub of 24th February 2013, Herve Magnificat identified a report and illustrations from John La Farge at Papara, Tahiti in 1891. He noted "Strangely, La Farge was travelling with historian Henry Adams, who didn’t notice any surf in Tahiti at all." While staying at Paparai, Adams was most impressed with "Old Mrs. Salmon" (Hinari? ), Tati's mother, who "when she is inclined to talk, she tells us about pagan Tahiti; old songs, superstitions and customs." At the end of the month, Adams and La Farge travelled to Tautira, the residence of Robert Louis Stevenson located on the south-east coast. Here, Adams, possibly contemplating the stories of Mrs. Salmon, wrote that he had neither "seen or heard of .. surf-swimming." If you do not know where Hilo is don't look for it on the map. One's imagination is the best map for travellers. You may remember Hilo best because it is the place where Clarence King's waterfall of old-gold girls was situated. The waterfall is still here, just behind the Severance house where we are staying. Mrs. Severance took us down there half an hour ago. She said nothing about the girls, but she did say that the boys used habitually to go over the fall as their after-school amusement; but of late they have given it up, and must be paid for doing it. The last man who jumped off the neighboring high rock required fifteen dollars. Mrs. Severance told this sadly, mourning over the decline of the arts and of surf-bathing. A Bostonian named Brigham took a clever photograph of a boy, just. half way down, the fall being perhaps twelve or fifteen feet. So passes the glory of Hawaii, and of the old-gold girl- woe is me! We escaped from Papeete two days ago. Unlike Samoa, Tahiti has a road. The French built it, and it is not bad, at least on this side of the island. swear by them, have no scruple in adopting and believing their faith only the road from Papeete here runs the whole distance along the foot of an old line of sea-cliffs, carved and modelled in charming variety by water-action, and evidently extremely ancient. At the foot of these old sea-cliffs is a strip of flat ground, evidently the old coral reef, sometimes a few yards wide, sometimes half a mile or more, and elevated barely ten feet above the sea-level. Out at sea, sometimes near, but never very far away, is the more modern barrier reef with its surf as usual. At eleven o'clock we arrived at Papara, and were set down at Tati's door. Door is not the right word, for one is not very conscious of doors hereabouts; but Tati's house is an old French affair, and though not very different from a Mexican adobe house, is planned with some regard to exits and entrances. From the first moment, I felt contented and I assure you, the sensation was both pleasant and unaccustomed, for some months have passed since I have felt disposed to say to the passing moment Stay! sister, I caught glimpses of an intense blue sea, through the open doors and windows behind; a sea that came close up to the grass, and had three lines of surf rolling in, through an opening in the reef, and rolling close up till they sent small waves into the entrance of the little river that flows close by the house. The present lady of the house, ad interim is Tati's sister, a young lady lately returned from Hamburg, with health affected by a German climate, and with no small amount both of intelligence and beauty of the Miriam type. In her, Miriam is stronger than the old mother, who is pure native, and delightful; almost untouched by Europe as my Samoan matrons were. Old Mrs. Salmon will not sit at table with us; she sits on the floor, like a lady, and takes her food when she wants it. When she is inclined to talk, she tells us about pagan Tahiti; old songs, superstitions and customs. but here the women wear clothes and no longer dance or swim on the reef. We have read all the works in Tahiti, and as for me, I am so tired of reading about the virtues and vices of the Tahitians that I wish I could see some. As for the Tahitians that have come within my acquaintance, except when they happened to be Jews, they have been the most commonplace, dreary, spiritless people I have yet seen. If they have amusements or pleasures, they conceal them. Neither dance nor game have I seen or heard of; nor surf-swimming nor ball-playing nor anything but the stupid mechanical himene. They do not even move with spirit. If I were not afraid of extravagance I should say that they were more melancholy than Hawaiians. With Tati and Meserve, we went on the reef one afternoon. The reef is an excessively curious coral wall, standing some two feet above the level of the lagoon, and averaging forty or fifty feet wide, like a superb boulevard, with a shining surface, absolutely unbroken by the smallest stone or inequality for miles. The outside surf constantly washes over it, and the surges of boiling foam every few minutes swamp one up to the knees, and often take one unexpectedly in a way that disturbs one's scientific reflections La Farge was luckier. He was delighted with the picturesqueness of the reef, with the water always rushing in little cataracts over its inner walls, and dashing in blue and green masses, dissolving into what Shelley calls star-showers, on the outer plane. Apart from a little nervousness as to the particular kind of poisonous coral, or slimy mass of tentacles, or purple or red animated bladders with indefinite worm-like arms, on which one walks, one is not reasonably nervous, for a big wave would knock one clear into the lagoon where one would be perfectly safe in three feet of water. There was Hinari, our old grandmother,- sitting on her mats surrounded by small grandchildren; ... no end of smaller children, dogs, chickens, occasional pigs, horses and domestics; and beyond, hardly a stone's-throw away, the surf rolling in miles of foam straight up to our hands. Very unwillingly we shall probably leave Tati's hospitality tomorrow. Our visit here has been one of the bright spots of our travels. Houghton Mifflin Company, Boston and New York, 1930, 1938. Geoff Cater (2007-2013) : Henry Adams : Letters from Polynesia, 1891. Adams travels with artist John La Farge to Hawaii, Samoa, Tahiti, Fiji, Australia, and Ceylon from August 1890 to September 1891. 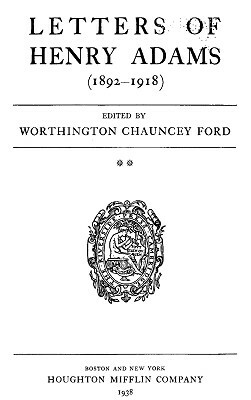 Privately prints Memoirs of Marau Taaroa, Last Queen of Tahiti. Revises and enlarges the Tahiti memoir as Memoirs of Arii Taimai for private distribution. Dies in Washington March 27 at the age of eighty. Amoung Hawai'i's Palm Groves, Coral Reefs and Volcanoes. John Murray, London, 1875. Letter XIV, Pages . Clarence Rivers King born on January 6th to James Rivers King and Caroline Florence Little of Newport, Rhode Island. King begins survey with study of Comstock Lode in Nevada. King becomes first director of United States Geological Survey.